The latest colorway of the Melo M9 pays tribute to Carmelo's roots and is out now. 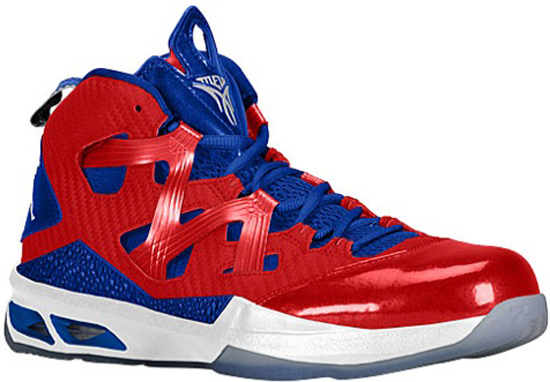 This Jordan Melo M9 is known as the "Puerto Rico" edition. They come in a university red, white and game royal colorway. Featuring a red based upper with white and royal blue accents sitting on an icy blue translucent outsole. A limited release available now at select Jordan Brand accounts worldwide. They released today, Thursday, June 6th, 2013. Retail is set at, $140. Enjoy the official image below of the "Puerto Rico" Jordan Melo M9 in university red, white and game royal below. If you're interested in picking these up, check in with your local spots to see if they received them. Those of you looking for a pair now can, click here to grab them on eBay.